It really does take all kinds to make the world I guess! 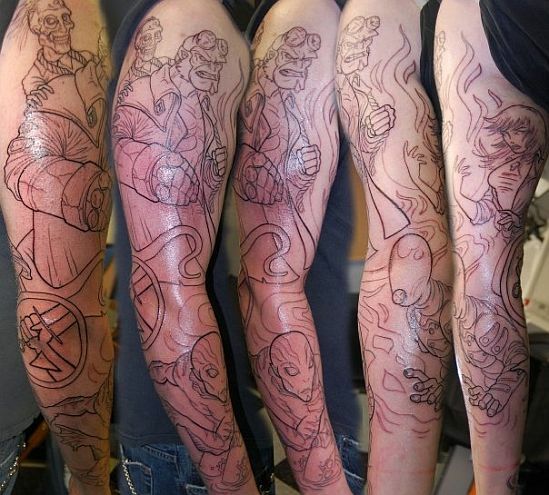 And since getting you body parts mutilated, oops, decorated with pictures of fictional characters is supposed to be an indication of your devotion to the character who in some obscure way also reflects your inner personality, is supposed to make you look COOL, this dude decided to get his whole arm covered with an episode of Hellboy! The stunning tattoo is finely sketched and I love the inking though I would personally have loved this tattoo artist to have been commissioned for something a little less… cliched!